Also on November 27, 2014, the great guitar icon Jimi Hendrix would have turned 72 if he were still with us today. Born in Seattle on November 27, 1942, Washington, James Marshall "Jimi" Hendrix was an American musician, singer, and songwriter. He is considered one of the most influential electric guitarists in the history of popular music. The Rock and Roll Hall of Fame acknowledges him as "arguably the greatest instrumentalist in the history of rock music." He passed away in London on September 18, 1970. 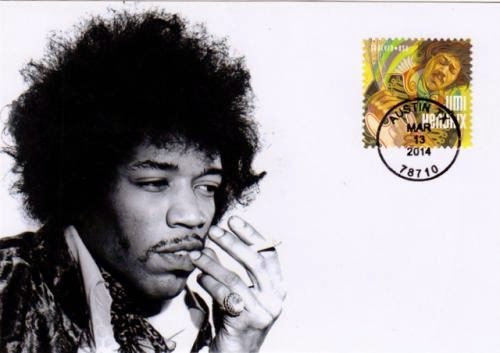 Postcard US-2776620 was a maxi card to Philippines showing a portrait of Jimi Hendrix with a Jimi Hendrix Forever Stamp and a first-day-of-issue postmark. USPS issued the stamp at the SXSW in Austin, Texas on March 13, 2014.